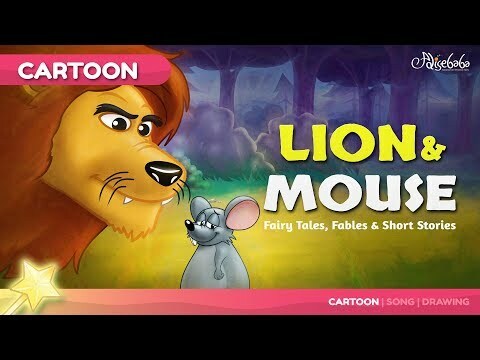 The Lion and the Mouse bedtime story for kids. The Lion and the Mouse is one of Aesop's Fables, numbered 150 in the Perry Index. There are also Eastern variants of the story, all of which demonstrate mutual dependence regardless of size or status. In the Renaissance the fable was provided with a sequel condemning social ambition. In the oldest versions, a lion threatens a mouse that wakes him from sleep. The mouse begs forgiveness and makes the point that such unworthy prey would bring the lion no honour. The lion then agrees and sets the mouse free. Later, the lion is netted by hunters. Hearing it roaring, the mouse remembers its clemency and frees it by gnawing through the ropes. The moral of the story is that mercy brings its reward and that there is no being so small that it cannot help a greater. Later English versions reinforce this by having the mouse promise to return the lion's favor, to its sceptical amusement. The Scottish poet Robert Henryson, in a version he included in his Morall Fabillis in the 1480s, expands the plea that the mouse makes and introduces serious themes of law, justice and politics. The poem consists of 43 seven-lined stanzas of which the first twelve recount a meeting with Aesop in a dream and six stanzas at the end draw the moral; the expanded fable itself occupies stanzas 13-36. A political lesson of a different kind occurs in Francis Barlow's 1687 edition of the fables. There the poet Aphra Behn comments that no form of service is to be despised, for just as the humble mouse had aided the king of the beasts, so 'An Oak did once a glorious Monarch save' by serving as a hiding place when King Charles II was escaping after the battle of Worcester.